PatientClick provides an electronic health records (EHR) platform for medical practices of any specialties, that includes scheduling, documentation, e-prescribing, and a full set of integrated practice management features. PatientClick offers an EHR solution that is tailored to office workflows, cutting down on the time needed to implement the platform. The charting and notes functions of the EHR are laid out to provide doctors with autofill and completion options to reduce the amount of time needed for writing during appointments. The clinical documents module also allows doctors to create custom templates that work with their own appointment flow. The built-in e-prescribing feature allows doctors to write prescriptions during the appointment, and office staff are able to instantly send those to the patient’s pharmacy of choice. The scheduling feature allows staff to schedule, edit, and view patient appointments within the system. Drag-and-drop options allow staff to easily edit individual appointments from within the calendar. And with the customizable information display, doctors can choose to see only information that is relevant to their practice. 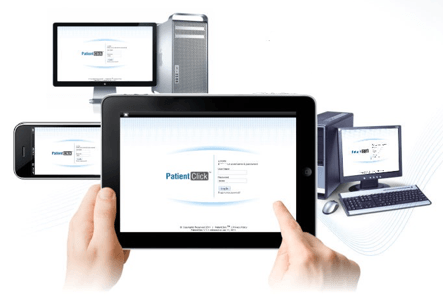 PatientClick offers lab interfacing to manage the test ordering and recordkeeping process. Lab reports are attached with each patient profile, as are exam charts and notes, providing one location where all patient information is stored and accessed. In addition, a Meaningful Use dashboard ensures that practices ate staying on track to Meaningful Use certification. All solutions by PatientClick are provided via a software as a service (SaaS) model, so practices do not have to worry about maintaining internal servers. Review more of the top EHR|EMR solutions with our Product Selection Tool, or if you’d prefer, call or email to speak with an unbiased Technology Advisor for a no-cost, no-obligation consultation on your unique requirements. Learn everything you need to know about PatientClick. Our experts will reach out to you shortly.